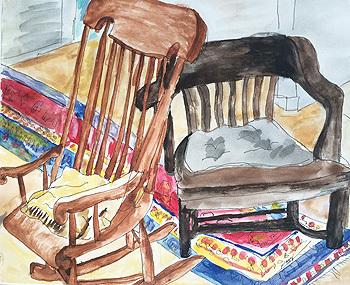 River Gallery School is showing work by outreach program artists as well as a retrospective by long-time RGS student and outreach participant Peggy Leo. 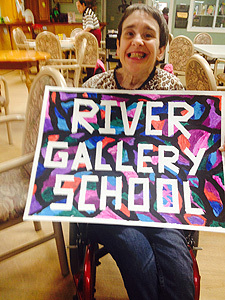 River Gallery School's outreach program was created in 2004 by founder Ric Campman and fellow artist Marilyn Allen in order to offer access to art making to those unable to come to the studio. 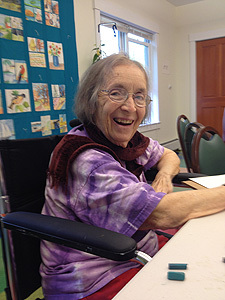 The program began in partnership with the Kindle Farm School, and over time has partnered with organizations such as the Brattleboro Senior Center, Bradley House, The Gathering Place, Morningside Shelter, the Boys & Girls Club, and the Women's Freedom Center, as well as the Holton Home, Thompson House, and Pine Heights nursing homes. Each week, RGS faculty members Marilyn Allen and Helen Schmidt visit various community locations, bringing pastels, oil paints, watercolors, and other mediums, offering instruction that includes the original RGS Sequencing process. 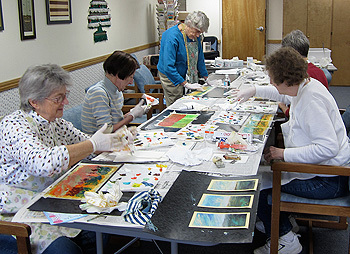 Bringing art to Brattleboro community members who are disabled and elderly has added emotional and therapeutic values to their experience of being creative. The therapeutic value of making art can go beyond traditional physical or occupational therapy, allowing access to passion, imagination, alternative forms of cognition, practice, and outlets and avenues for self-expression, as well as an enhanced sense of connection with others in a group setting. Allen is grateful to bring her own relationship to art making to the program, having begun to paint only at age 50. Her mission became: "Everyone should have a chance to paint sometime in their life." Many students share that the RGS outreach sessions are the highlight of their week. Allen believes that there is an important human aspect to art making. The participants in her classes are coming to paint because it makes them feel good, helps them to feel connected to the world, and is a way to express themselves. RGS faculty member Schmidt believes in the restorative and enriching benefits: "With our outreach program, we are able to connect with people who display a diverse array of abilities, talents, and life experiences. In listening to their stories, I have learned a great deal; we have taught each other." "All her life, Peggy brought a colorful and expressive symphony of artwork to life around her. As a young mother, she created cartoon-style line drawings depicting her new family, and her hand-sewn Easter fashions once earned her mention—including photographs—in the New York Herald-Tribune. Peggy's bachelor's degree in art education included projects such as an abstract color-spectrum-spanning quilt and a collage poster reading 'NETWRK' in spidery, intertwined letters. Intently focused on the font and aesthetics of the piece, Peggy omitted the O. "She was fascinated with printmaking, transferring children's drawings to wood and linoleum blocks, and eventually offset lithograph, to produce 'children's art' calendars for many years running. After Peggy's central nervous system was disrupted, first by a tumor, then by the side effects of the cure, her art took a decidedly folksy turn. Using oil paints, she created joyful realist portraits and still-life studies from photographs, often scratched in the style of her mentor, Ric Campman. She also produced an annual holiday card, featuring line-drawn, hand-colored angels, combining the spirit of the early cartoons and the annual calendars from her earlier years. From her youth to her final years, Peggy took great joy in the practice of making art, which she generously shared with all those around her."